Stay at this conveniently located Werribee motel, close to Werribee Mansion, Werribee Zoo and the Rose Garden. 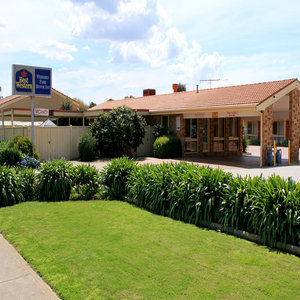 The BEST WESTERN Werribee Park Motor Inn offers luxurious and affordable accommodation in Werribee. All rooms are non smoking and include high-speed Internet access and mini bars. Other facilities at this Werribee motel include a pool and spa available in the summer and also a BBQ for those lovely warm nights. Guests staying at the BEST WESTERN Werribee Park Motor Inn will be minutes away from restaurants, shops, Werribee RSL and the train station. It is a five minute drive to Werribee Park Equestrian Centre. The motel is a 20 minute drive from Melbourne airport and 20 minutes from Avalon airport. For friendly service and a convenient location in Werribee, make a reservation at the BEST WESTERN Werribee Park Motor Inn today and save!